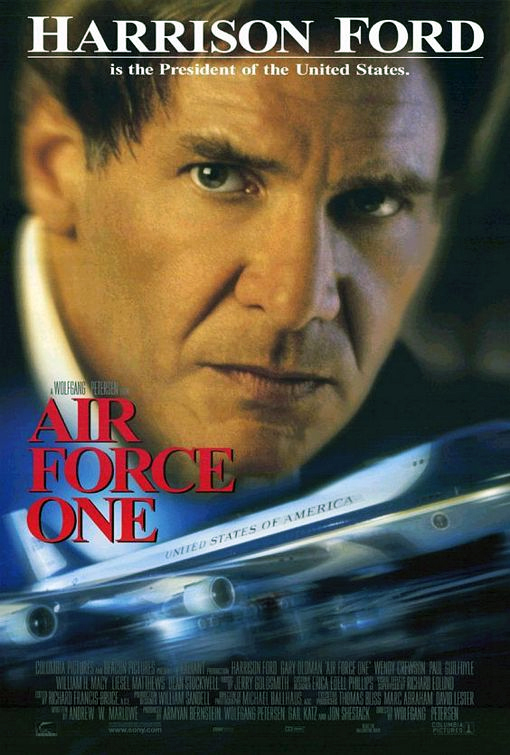 Terrorists hijack Air Force One with the President onboard (Harrison Ford). VIOLENCE/GORE 8 - Many people are shot by machine gun fire and killed; some have blood on them and sometimes their bodies jerk with the bullets (the blood is found on all body parts and it looks quite thick and red). We see corpses lying in blood and blood on walls, carpets, etc., bloody bandages (arms, head, chest). Some people spend most of the film with blood on them and bruises and scratches (there are several close-ups). A few times people are shot point-blank in the head. Some explosions (including a couple of plane crashes). Some extended fights with punches and kicks. A man is choked by a cord as he's pushed out of a plane; we see his corpse dangling. Other people fall out of a plane and to their death. LANGUAGE 6 - Five F-words, some anatomical references, a couple of scatological references, many mild obscenities. DISCUSSION TOPICS - Terrorism, hijacking, the presidency, politics, negotiating. MESSAGE - One should not negotiate with terrorists.